Bryant Collins was driving on Highway 72 in Madison County, Ga. when he spotted a shocking sight. "I had seen something out of the corner of my eye, and I thought it was a baby," Collins told WXIA. 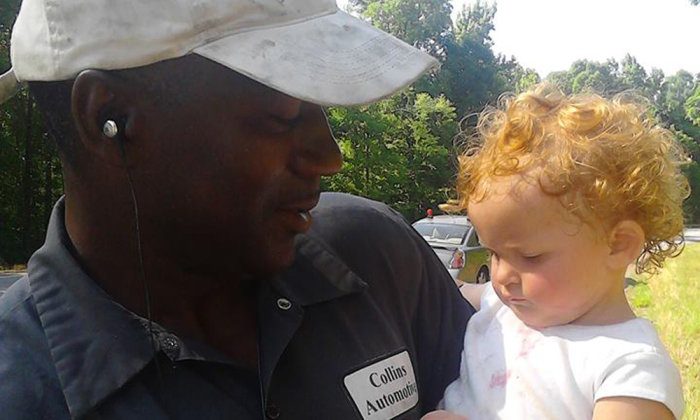 "I just stopped and, when I got out, there was a baby … almost in the highway." The baby turned out to be a 15-month-old girl who had wandered out of her house and crawled 300 yards through the woods toward the highway. Collins, an auto repairman, called 911, and the child was soon in care of the authorities. Her father fought with police and was arrested. During the two hours Collins spent with the child, she naturally started to cry during the frightenting ordeal. In turn, her rescuer turned to his own source of peace. "The baby started crying," Collins said, "so I turned my phone on and let her listen to some gospel music, and she calmed right down. I know gospel music calms me down." And peace is something Collins worked hard to achieve. He served 10 years in federal prison for manufacturing cocaine, and has been free and clean for five years.